Maintaining a healthy lawn and garden is possible only when proper fertilizer is used at suitable times. Researchers at Colorado State University have found that weeds can even flourishin an unfertilized lawn orgarden. Proper fertilization is important as a healthy lawn actually is capable of fighting off weeds.Use a professional golf course type of fertilizer like a 65% slow release granular fertilizer that feeds your lawn slowly over 6 to 8 weeks. Weeds,when dried, lose its uptake of weed killing product. Drying out does not help as weeds can survive drought conditions. Therefore, it is easier to check the spread of healthy weeds through powerful herbicide than controlling the dried weeds. It is very important to know the class and type of weed before uprooting them manually from your garden. Some weeds can be easily uprooted and this negates their chance of re-growth. However, some weeds with their roots reachingtoo deep in the soil require extensive labor or a professional to be uprooted. Besides, uprooting these weeds may activate the regenerative root system that will trigger more growth. Having a proper understanding of the ingredients of herbicide as well as its limitations will help you select the most suitable weed killing product and make the most of it. herbicide come in two different forms: Selective products and Non-selective products. Selective herbicides are those that effectively check the growth of weeds without damaging the nearby plants. These products are ideally used in lawns, gardens, and crops. Non-selective herbicides destroy any and every plant they come in contact with. They prevent the growth of grass, dandelions and other weeds or thistles in the area. They are best suitable for areas near fence rows, drains and irrigation ditches, pavements or sidewalk crack, etc. Hence it is a good idea to use a proper Selective herbicide,rather than using a general one,to eliminate weeds from your lawn. It is very important to find out the key ingredients and follow the label and guidelines to get the best results from the use of weedicide. One must use the recommended amount of the product in case one requires preparing the solution mixing herbicide in water. When it comes to using the herbicide, one must remember not to use it against other crops for which the product may be harmful. Besides this, one must also check the spread of dandelions seeds through the breeze. It is commonly said that in a war an attack on the enemy is the best defense. If you want a healthylawn then you must be proactive to select and use the proper herbicide for early and effective treatment of weeds. You must properly maintain and water the lawn that will act as the best defense against turf weeds. For dandelions it is important to nip them in the bud and remove or treating them before they develop. 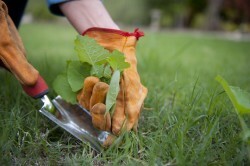 If you require professional weeding or Lone Tree Lawn Care service then you can rely on a pro landscaping expert of www.bestyard.com.